Did someone start a new meme when I was away? 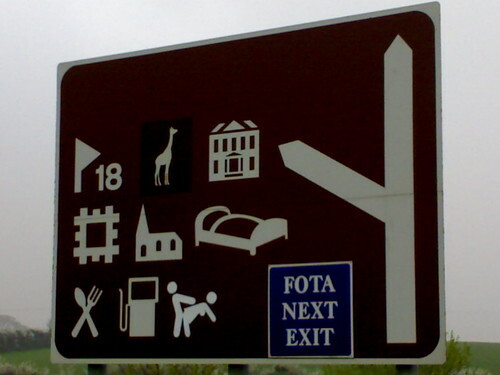 I was driving home from the city on Saturday when I noticed that the sign for the Cobh exit had been updated (see the icon to the right of the petrol below). Either the Cobh Harbour Chamber of Commerce has taken a more open view on tourism and lifestyles than heretofore or we have a budding Banksy in our midst! The Irish Road of Doom! Via MacManX comes the Irish Road of Doom! I knew the roads in Cork were bad, but jeez! How many clients do we know like that? I found the show to be truly refreshing because Tom asked all the right questions from the clientâ€™s perspective. Who knew my lack of knowledge could be such an advantage? I can see whole new vistas opening up. There must be hundreds of jobs about which I know absolutely nothing (brain surgery, astrophysics, IT (oops!)). I could brand it as The Clueless Manifesto! – â€œNeed a guy who knows absolutely nothing, Tomâ€™s yer only man!â€?